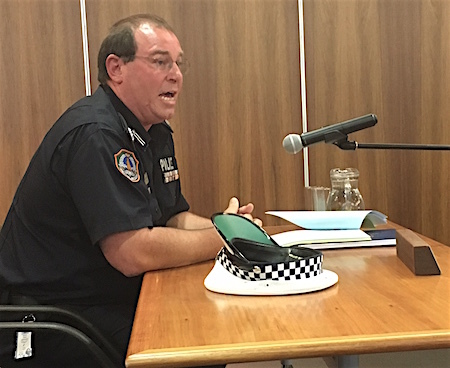 Police never respond to reports of crime on social media, Commander Danny Bacon told the Alice Springs Town Council last night. These reports have the potential to generate “vigilante activity” which doesn’t do the community “any justice”. He said he is “very concerned about some of that activity”. Cdr Bacon was fronting the council to talk about the now abandoned proposal to close the police station at night. The discussion turned instead to an overview on law and order more generally, especially “the challenges” of property crime. Deputy Mayor Jamie de Brenni had commented about “the lack of confidence in comms” (calling police) – too often people are answered by “Darwin trainees”, who don’t know the location. In frustration these people resort to social media, where they get “a reaction straightaway and a response”. Cdr Bacon acknowledged the frustrations, which can be felt even in Darwin, but police will not move away from a “centralised model” for dealing with calls. Instead they are looking to better training. Mayor Damien Ryan raised the problem of Alice Springs locals not being familiar with the names of their suburbs, such as “Desert Springs” (known locally as the “Golf Course Estate”). Many people continue to identify their location as simply Alice Springs, he said. Cdr Bacon said that despite the frustrations, having calls dealt with in Darwin has yielded a better police response. He said when the calls were being answered locally a lot were getting “lost” or there were long delays in answering them. He said most of the offenders involved in the spate of property crime over the holidays have been identified. During January the scale had tipped towards more youth being involved, acting in small groups. Until then the proportion had been half/half, adults and children. He said the majority of the youths were local, though some were from outlying communities. A lot had not come to police attention before. To questions from Councillor Eli Melky, he said police had not found that adults were using children to break in (through small windows, then opening a door, as Cr Melky suggested). He said most of the offenders were in the 11 to 16 years age group. The “pinnacle” of break-ins was reached on New Year’s Eve, which left the community “quite scarred”, but they had lessened over the last two weeks. He spoke of the police’s new “Strike Force Winx”, which would focus on prevention and intelligence as well as enforcement. He said youth “get labelled a lot” with the crime in town but the majority of youth are not involved, so Winx will focus on youth in general, not just youth involved in crime. He said the kind of activities for youth that were seen over the holidays need to be an ongoing program, and police are looking to work with stakeholders across the community in this regard. He was feeling “quite positive on the way forward”. He also spoke of the importance of people securing their properties: once the property has been broken into, offenders know how to gain entry and unless it is secured that property will be targeted again. He said police work with property crime victims to look at their “environmental design” to strengthen security. There is “no end date” for Strike Force Winx. Is there one for the police at bottle shops (POSIs)? Cr Brendan Heenan wanted to know. He recognised that it is “boring job” for police but “people feel safer”. Cdr Bacon said police will maintain POSIs until well and truly after the re-introduction of the Banned Drinkers Register. He said they are achieving “great reductions” in violent crime both in town and in outlying communities. Eventual change could see them being used as a “tactical model rather than a saturation model”. On the proposed closure of the police station at night, he told council he accepted full responsibility for the lack of public consultation. The outcry had made him fully aware that police must deal with not only incidents of crime but the “fear of crime” that was playing heavily on “the psyche” of individuals’ minds in the community. He had quickly realised that keeping the front counter staff at night was necessary to put the community “at ease”. @ Bev Emmott: “When the police claim that fraud is a family matter then they bring disrespect to themselves as they are failing to do their job”. Yes, Bev, it was the same for domestic violence: Only since the 1970s has the criminal justice system begun to treat domestic violence as a serious crime, not as a private family matter. A crime is a crime that can be committed by relatives or strangers. It would seem summer programs did not help. What makes people think that permanent programs would make a difference? Maybe it is because the police fail to protect the innocent people being abused in this town. I reported my bank accounts being used by others – the bank saw but the police said it was a family matter. When the police claim that fraud is a family matter then they bring disrespect to themselves as they are failing to do their job. Social media has got this information out of town so they cannot hide it anymore. ‘Police never respond to reports of crime on social media’ says Commander Danny Bacon. You need to come into the 21C Danny – the South Australia police force, which is acknowledged to one of the best in Australia, interacts and works with their employers, the public, very well. Social media is one the means of doing this. Can Bottle shops pay for their own security and let the Police get back to their ‘real’ work? It’s much like most businesses if you have dangerous/dodgy people visiting you employ security, why are they getting it free? Clubs hire bouncers.. why don’t they get free Police security….. Does the person who answers the phone deploy the actual officer who will attend the incident? If not, why would they need to know where a certain address is in Alice Springs? Wouldn’t they just pass on the address info and incident details to the responsible person down here or log it into their computer if it’s a computerised deployment system. People need to report anything to Police no matter how small, get the real stats up so someone notices. By no way are the police not doing their jobs, they are awesome. It’s the tools around them that aren’t up to scratch.